New Tech men’s basketball head coach Josh Pastner will have to wait until 2017 to bring his first solo recruiting class to Atlanta. 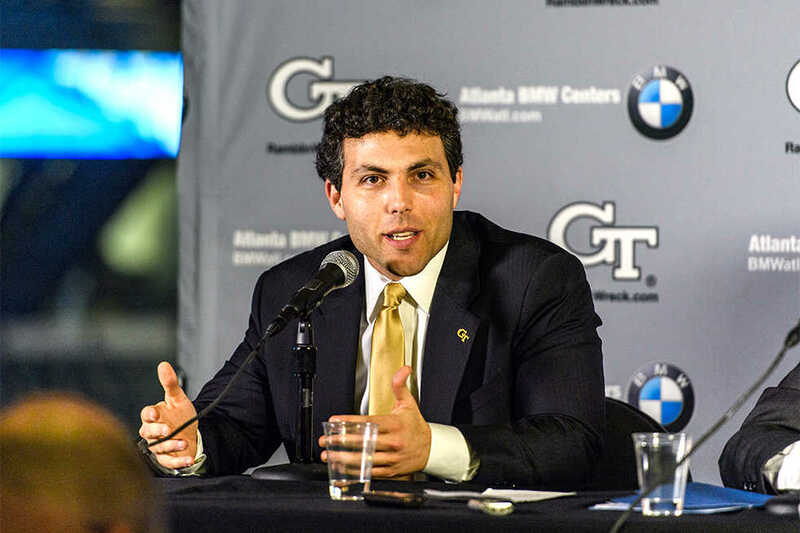 By the time Pastner accepted the Tech job, the recruiting period was mostly over. Almost every top player had committed already, and Tech themselves had a three person class. However, only two of the commits from the Gregory class signed, and with the transfer of former player Travis Jorgenson, Tech had some open scholarships for this season. With the addition of two graduate transfers, guard and forward Jodan Price and forward Kellen McCormick, Pastner has demonstrated that he is willing to search in unlikely places for talented players. Price, who is originally from Indianapolis, Ind. has one year of NCAA eligibility remaining. Price is familiar with the transfer process, but he will be able to play immediately this time. Price ranked as one of the top 150 recruits of his class by Rivals and initially enrolled at DePaul University. After a quiet year, Price left Chicago for Ypsilanti, joining the Eastern Michigan Eagles. NCAA rules mandated that he sit out the following season, one that saw the Eagles notch 22 wins, a mark the team had not reached since their 1996–97 campaign. At Eastern Michigan, Price saw significant playing time off the bench. He averaged 15.6 minutes-per-game over his two seasons there, taking most of his shots from three-point range. He never achieved consistent success beyond the arc, however, making only 28.5 percent of his shots from that distance in his Eagles career. Price comes from a major basketball pedigree. Price’s brother, Austin plays at Lehigh. Price’s uncle played at Notre Dame and another uncle at Purdue. As a high schooler, Price attended Detroit Country Day, an institution that has produced such talent as former Duke and NBA guard and forward Shane Battier and Chris Webber, a member of Michigan’s famed “Fab Five” and the first overall pick of the 1993 NBA draft. Price was an integral part of the team’s success, leading it to a 44-10 record over his last season there, courtesy of Eastern Michigan’s team website. Given Tech’s depth issues at the shooting guard and small forward positions, Price should be able to step in immediately and play big minutes. Tech has had issue the last few years with shooting at those positions. There will be minutes for whoever can put the ball in the hoop. Coach Pastner traveled to the other side of the Wolverine State to court his second transfer, Western Michigan redshirt senior Kellen McCormick. In his final season with the Broncos, he shot at a 45.8 percent clip from that distance, a team best. McCormick stands at 6-foot-8-inches and should be able to provide consistent shooting for the Jackets off the bench. After losing Adam Smith, Tech will need a sharpshooter from beyond the arc to carry the load. McCormick was Western Michigan’s third-most prolific scorer per minute, with the team’s best shooting percentage. His mere 5.2 rebounds per 40 minutes, however, suggest that he will not provide a physical presence near the basket for the Jackets, but that is expected given 80 percent of his FGA in 2015-16 were from beyond the arc. Despite his excellent field point percentage and three point percentage, McCormick struggled from the free-throw line, only converting 68 percent of his free-throw attempts. Free throw shooting has haunted Tech of late, and Tech is not in a position to give points away this season. For a team looking to right the ship under a new helmsman, though, McCormick and Price both provide precisely the qualities Coach Josh Pastner is looking for: veteran leadership and added depth to a young and inexperienced Tech team. Pastner’s coaching system is very different than former head coach Brian Gregory. Pastner has to find players he thinks will fit his system, and belives he has that with Price and McCormick. There are no gaurantees for the starting lineup either, but every player will get their chance to prove themselves. The current players have bought into what Pastner is saying and that is obvious with the small attrition Tech had over the offseason. Only point guard Travis Jorgenson transferred. That move appears to be one that will benefit both parties. Jorgenson was not a scheme fit for Pastner’s up tempo offense and transferring will give him the opportunity to play Division I basketball with a bigger role. This season will not be easy for the Jackets. They are replacing alot of players from a solid NIT team. The goal for the Jackets is to compete at a high level, improve as the season goes on and for Coach Pastner to take a step in the right direction on the 2017 recruiting trail.